What types of extra funding are available to help you at university? - Which? What types of extra funding are available to help you at university? If you need an extra loan for your student finance, or think you might be eligible for a hardship fund or bursary, it’s worth seeing what you can get. you’re studying a particular type of course. Bursaries used to be available from the NHS for students in health fields, but this has significantly changed in recent years. Find out what the changes mean, whether you’re a new student or are already at university, in our NHS bursary guide. We recommend applying for student finance (ie tuition fee loans and maintenance loans) to see what you're already eligible for. 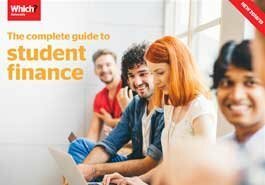 Read our specific guides for student finance in England, Scotland, Northern Ireland and Wales. What are they? Scholarships and bursaries come in various shapes and sizes. They might be offered on the basis of your academic abilities, they may be means-tested (ie based on your household income and personal circumstances), or perhaps a combination of both. They might also be offered for other reasons – for example, if you have a disability or dependants who rely on you. Funding like this can last for one year of your university course (usually the first year), or they can extend over the whole period of your studies. Scholarships try to cover some or all of the cost of your tuition fees and living costs – meaning you won’t need to borrow as much in terms of student loans or as an extra on top of what you're entitled to. Plus, they don't need to be paid back! Where do you get them from? These are offered by universities, further education (FE) colleges that offer degree courses, charities, trusts or even your local council. What's available and the eligibility criteria you have to meet will vary. Find out more about bursaries and scholarships available, plus we asked students who successfully applied for them to share their top tips. What are they? In effect, fee waivers reduce the amount of your tuition fees. You can get fee waivers just by themselves, or you can get a mixture of a fee waiver and bursary in one package of support. Plus, none of your fee waiver has to be paid back. Where do you get them from? A university or college might offer to reduce the cost of your tuition fees for a year or more, rather than give you a cash payment, or they could give you both. This means you don’t need to borrow as much from the Student Loans Company. Bear in mind that because a high proportion of students will never pay off the full amount of their student loans that this might not be as generous as it appears upfront. What would be better for you - a fee waiver or a bursary? What are they? These are designed to help if you’re having financial problems, either while you’re at university or when you’re applying. They are awarded by institutions themselves, with the amount of money decided on a case-by-case basis. As of the last few years, universities and colleges fund these themselves (previously the UK government funded these as well), as well as deciding who should receive this cash. There’s usually an application form to complete in order to state your case. You can apply either if you simply have less money coming in than going out, or if an unexpected cost arises like an expensive repair bill. Your circumstances will be taken into account and certain groups – student parents, disabled students and so on – will normally be prioritised for help, although all UK students can apply. Where do you get them from? You can get these via your university or college's student services or finance department, either when you’re already at university or in some cases while you’re applying there. Because these are decided case-by-case, it's worth researching what's available yourself in relation to your own circumstances, rather than going on the word of other students who've applied for these – just because someone else received a certain amount (or were unsuccessful) doesn't necessarily mean you get the same result. You'll need to take documents that confirm how much student finance you receive as well as expenses and outgoings (eg bank statements). Learn more about hardship funds on the GOV.UK website. It's also important to think ahead to day-to-day costs while you're studying at uni. Look at these six ways to get money-ready before you go. Download our materials for free to your device - perfect for printing and sharing with students and parents. We would like to send you great free advice about uni - and information about other relevant Which? Group products and services. Do you understand your child’s student finance? Your child can get money towards tuition fees – now capped at £9,250 a year for UK and EU students – and for living costs. Find out more in our guide. Juggling your money at uni can take some time getting used to (but it's a vital life lesson). Here are 10 things that should be top of your budget. Do you know how student finance works? Find out if you can get student finance and how to go about it.